Most runners mentioned that the Inov-8 Trailroc 270 offers less cushioning but provides plenty of protection for off-road running. Several users lauded the performance of the rock plate; it protects the bottom of the feet efficiently. The trail running shoe offers great traction on varied trail surfaces, based on some user reviews. A few buyers mentioned that the shoe is comfortable. Some were happy with the shoe's lightweight design. The shoe is good looking, according to a few comments. A significant number of purchasers said that the shoe runs small; a few even described the sizing as `weird`. The Inov-8 Trailroc 270 is a lightweight trail running shoe. Most trail runners admired the shoe's traction, design, and performance. Though there have been issues when it comes to the sizing, the Trailroc 270 has still proven to be a reliable shoe. If you are a runner who is looking for a shoe that offers less cushioning but impressive foot protection, then you should include this shoe in your list. If you are after a lightweight shoe for fast training and racing over rocky mountain tracks and hard-packed trails, the Inov-8 Trailroc 270 is the shoe for you. With a low profile look and a road-racing feel, this shoe provides superior ground feel and its unrivaled grip on dry rock will inspire confidence on technical, rocky trails. This does not feel like a daily running shoe, especially for the heavier runner, and is not designed to be an all-terrain shoe. That really does sum up this shoe, but in providing a little more insight, I’d describe the feel of the Trailroc 270 as more like a fast road shoe rather than a chunky trail shoe. It’s snug fit and low profile, together with a 4mm heel to toe drop make it the ideal shoe for faster training runs or races. The small studs and sticky rubber that make up the outsole grip fantastically well on trails and rock, especially when dry. The Trailroc 270 is designed to be lightweight and flexible but still incorporates a “Dynamic Fascia Band” rock plate to provide protection from sharp rocks. Whilst not quite as robust as the plate on shoes such as the Roclite 290, this band manages to flex with the foot to provide an improved feel underfoot. The Trailroc 270 should not be considered a multi-terrain shoe. It offers little grip on soft, muddy surfaces, and the sticky rubber sole compounds which offer superlative grip on the trail and dry rock can become compromised in wet weather. Over the last few weeks, I’ve run just over 50 miles in these shoes, subjecting them to a variety of hard-packed and rocky trails, as well as rocky mountain paths, and a few other terrains besides. I feel that I’ve tested them out thoroughly enough to review them. 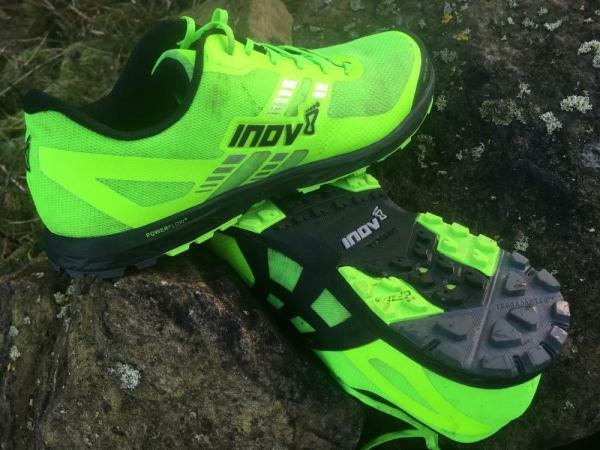 Inov-8 offers the Trailroc 270 in two colorways; black/red and green/black. As shown in the picture, my shoe was the bright green / black option. The Trailroc 270 is designed to be a fast, no-nonsense trail-running shoe, but that hasn’t prevented the designers from coming up with a great looking shoe. The shoe has an impressive low-profile look to it, and the materials feel hard wearing and durable. The shoe provides good cushioning around the heel cup and the tongue. As befits the design of the shoe, there is just sufficient cushioning in the right places to provide a comfortable fit and ride, without the unnecessary weight that a highly cushioned upper would require. The Inov-8 Trailroc 270 is listed at 270g (hence the name) or 9 ½ oz, which makes it comparable to a road-running shoe in terms of weight, and lighter than many shoes of this type, such as the Salomon Speedcross 4 which comes in at 310g. Most importantly, the Trailroc 270 has a light low-profile feel when running. The small studs on the outsole provide grip on rock and hard trails without the unnecessary weight and protrusion of an all-terrain shoe, improving ground clearance and making it faster over such terrains. An Inov-8 shoe will often provide a snug fit, which can be a concern if you’ve not previously worn an Inov-8 shoe. With no half sizes available, I went for a UK 13 (US 14) which is what I’d wear in a normal, everyday shoe, and in a Brooks or ASICS shoe (for comparison purposes, in shoes from New Balance, Hokas, and Salomon I’d generally need to go for a ½ size larger (UK 13 ½). The Trailroc 270 did provide the expected snug fit, though I found them a little more roomy than the very snug Roclite 290. The heel cup of the Trailroc 270 is low but holds the heel well. It provides a little more room in the mid-foot, and also in the toe box. This can be seen on the picture in which the slight rippling of the upper in the inside of the shoe gives an indication of extra room in the midfoot. This should not be taken to mean that the shoe is “baggy”. The foot feels as if it is held well, while the cushioning in the heel cup and tongue provides good comfort. The upper of the Trailroc 270 is formed from a single layer of breathable mesh which holds the foot while allowing good airflow. A printed overlay (seen on the pictures in a brighter green) runs around the front and much of the outside of the shoe, providing a little more structure and resistance to tears from sharp rocks in these areas. The heel cup offers good cushioning, which extends around to where it meets the Metcradle which makes up the midfoot section. The only seam inside the shoe comes at the point in which these sections meet, and whilst the seam is pronounced, I didn’t feel it when running, and it certainly hasn’t caused any discomfort. The “Metcradle+” used in the Trailroc 270 is a further development of the Inov-8 “Metcradle” printed overlay system which runs from the lace holes down to the sole, holding the midfoot securely in place and providing some extra support in this area, preventing unnecessary movement of the foot on uneven terrain. A strengthened rubber toe cap runs around the front of the shoe, to protect the toes from any impact from stones and rocks. This is not as substantial as the cap provided on some of their other shoes, and presumably represents a compromise between protection and weight. It does provide effective protection and is more than adequate for a fast, racing shoe. To summarise the construction of the upper, it fits well and is comfortable without offering unnecessary cushioning. The foot is held securely, and I didn’t feel any movement of the foot inside the shoe, providing confidence in fast descents and steep sections over even the rockiest of surfaces. The “Powerflow+” midsole in the Trailroc 270 has been designed by Inov-8 to deliver 10% better shock absorption, and 15% more energy return than standard midsoles, though I’m not really in a position to determine the accuracy of these findings. A “Dynamic Fascia Band” rock plate is used in the Trailroc 270 to provide underfoot protection from sharp rocks. This band is designed to have greater flexibility than those incorporated into many other trail shoes so that the protective plate flexes with the foot during running. The shoe has a 4mm Heel to Toe drop. While I often find the drop less significant in a trail shoe than a road shoe, I am sure that this small drop combines with the low profile design of the upper and sole to provide a feel more akin to a racing flat than a traditional off-road shoe. In my personal opinion, there is a lack of cushioning and absorption in the midsole that prevents me from choosing this shoe for regular training runs. Similarly, it is possible that whilst the Dynamic Fascia Band provides great feel through improved flexibility, it doesn’t provide quite enough protection for long training runs on looser trails consisting of stones / small rocks. I should point out however that I am heavier than many runners, currently weighing in at around 90kg / 200lb. This will make a difference in the requirements for cushioning and the effectiveness of the rock plate, which I’m sure is more than adequate for the average sized trail runner. The outsole is constructed from a “Tri-C Sticky Rubber” compound which utilizes different types of rubber in different areas of the sole. The hardest, most durable rubber is on the heel (dark grey on the pictures), with a soft rubber up the center for increased traction (black), and a medium rubber on the edges for grip (green). What this brief summary doesn’t convey is just how “sticky” this “sticky rubber compound” is. When taking the shoe out of the box, or trying it on in the shop, simply run your palm across the sole of the shoe and you’ll be amazed at the way in which the rubber holds your palm as it moves across the surface. I haven’t found a shoe from another manufacturer that manages to achieve this. This grip translates exceptionally well to traction on rocks whilst out on mountains and trails. It makes rocky descents more enjoyable and faster, thanks to the confidence that the grip provides. The small (4mm) studs are well designed to improve grip without accumulating debris during the run. The studs help with traction on dry grass surfaces, and on sandy trails, but this shoe is not designed for running through muddy fields, so don’t expect much grip in these environments! If you’re short on time, then the brief summary is that this is a great shoe for racing and fast sessions on rocky surfaces and hard packed trails. It may not be the ideal everyday shoe, or for longer training runs where there is a lot of loose rock/stone, especially for the heavier runner. The first time I put on these shoes was for a run around Newborough Forest on Anglesey. This a regular running haunt of mine, and a fantastic location to run with a variety of undulating hard packed, loose and sandy trails, as well as meandering paths through the forest. The shoes fit well right out of the box, and I just ran by feel for about 7miles or so. I’ve run this forest numerous times over the years, in a variety of shoes, but this is the first trail shoe which has actually felt fast. Whilst running, the feel is more like a road racing shoe than a standard trail shoe, and in my experience, it’s rare to feel light on your feet when wearing a trail shoe. The foot felt secure throughout and, whilst admittedly the trails around the forest aren’t particularly technical, there was very little movement in the foot, and I felt confident, even when moving quickly. Unlike many trail shoes, this one seemed to encourage you to speed up, and so I put a couple of bursts in on some sections I know well, and wasn’t surprised after my run to find that I’d run faster on these sections than during any previous run (even managing to pick up a much prized Strava CR on one of them!). I’ve since had the chance to run in these shoes on a variety of terrains, some more technical than others. The shoe performs exceptionally well on dry hard packed trails and on rocky mountain paths. It feels fast and the grip provided by the sole gives fantastic confidence. If I’m after a shoe for a race on hard terrain, especially in the summer, then this would be the first I’d pick up. On a rainy day in Wales, with the prospect of a variety of terrain including grass, mud and wet, technical trails, I’d leave the Trailroc 270 in the cupboard and pick up the Roclite 290, which offers far greater versatility. As mentioned above, I’d also prefer a little more cushioning in the midsole to consider this as an everyday trail shoe, especially on more rocky trails. My own weight, however, may be significant in this assessment – a 200lb runner landing repeatedly on small rocks is far more likely to feel the cumulative effects of these impacts than an average-sized mountain runner! I’m confident that the improved ground feel that comes with a minimal midsole and flexible rock plate will appeal to many mountain and trail runners looking for a fast racing shoe. In summary then, the Trailroc 270 is a lightweight fast racing shoe for hard-packed trails and rocky mountain routes. Its no-nonsense, low profile look and feel makes it a great choice for racing, though it may not appeal to everyone as an everyday shoe. I’ll make a brief comparison with the Salomon Speedcross 3 which I used for most off road runs for a couple of years, and also the Inov-8 Roclite 290 which I have worn more recently. Whilst neither comparison is truly applicable because the Trailroc 270 does not pretend to be an all-terrain shoe, it may help provide an indication as to how this shoe differs. The picture shows the relative grip of the Speedcross 3, the Roclite 290 and the Trailroc 270. Despite the increased wear of the Salomon shoe (light grey) which has covered approximately 500 miles, it should be clear that the Trailroc 270 has a much lower profile stud, giving greater clearance over the ground, and making it less likely that you’ll catch the foot on protruding rocks and stones during the forward movement of the stride. I should also mention that both Inov-8 shoes fit snugly to the foot in a way that the Speedcross 3 does not manage (I found the foot moved around significantly in the Speedcross 3, especially when the shoe became wet, and also during steep descents when the toes could crash painfully against the front of the shoe with every footfall). If you’re looking for a fast, lightweight racing shoe with a road-shoe feel for hard trails and rocky mountain routes, then the Trailroc 270 is definitely worth considering. Heavier runners may be better to consider a shoe with more cushioning and a more robust foot plate, especially for everyday running, and longer runs. If your preferred trails are tamer in nature and you like a bit of ground feel this is a good shoe. If you run on more technical terrain with rocks that could bruise your feet if you are not careful I would look for a shoe with more protection. The Inov-8 Trailroc 270 is a running shoe that’s designed for the neutral pronator who wants to tackle the trails with ease and confidence. It has a low-to-the-ground profile with a set of midsole elements that help protect and propel the foot forward. Three rubber compounds are used in the outsole unit. These elements work together to deliver precise performance output on the various types of terrain. A single groove near the forefoot encourages the natural flexibility of the wearer’s foot. A seamless upper design allows the wearer to experience a smooth and consistent in-shoe feel. A set of overlays reinforces this section, keeping it upright and intact. A toe cap protects the toes from any abrasive surfaces or debris. The Inov-8 Trailroc 270 was designed using the standard measurements. It makes use of a sizing scheme that adheres to the preferences of consumers. The women’s version has a width profile that’s equivalent to B – Medium while the men’s version makes use of the D – Medium profile. This model follows the ‘3’ determinant in Inov-8’s Fit Scale, which means that it accommodates those who have regular foot dimensions. As an important note, it also follows the Standard Fit design, which means that its forefoot has a wide box that accommodates natural toe-splay. The Strobel Last is a process that involves stitching the upper is stitched to a full-length fabric on the platform. Its purpose is to heighten durability and allow natural movements to take place. The first one is a heel-specific layer called Hard Sticky Rubber. This material offers protection during the foot-strike, staving off the debilitating effects of ground abrasion. The middle part of the platform features the Soft Sticky Rubber, a reactive piece that potentially heightens underfoot cushioning. Wet surfaces are its focus when it comes to traction. A Medium Sticky Rubber lines the perimeter, and its purpose is to add extra grip when handling slopes and tricky edges. The 1-Arrow Shock Zone is Inov-8’s determinant for a minimum level of cushioning. The platform still has more heel height as it has a 3-millimeter drop, but it’s close to the ground. The main midsole compound is the Powerflow+. This foam runs the entire length of the Inov-8 Trailroc 270. It’s touted to provide 10% better shock attenuation and 25% more push-off energy. The Dynamic Fascia Band is a layer in the midsole that acts as the tendons of the foot-pad. It bends during the heel-to-toe transition, then springs back into place during the actual toe-off, thereby giving more energy and bounce. Also, it protects the underfoot from stones and other elements on the trails. The Inov-8 Trailroc 270 features a seamless mesh. Its purpose is to provide a smooth and irritant-free coverage. It also allows air to enter the foot-chamber with ease. An External Toe Cap is a fused material that protects the toes from abrasion. It also prevents the nails from digging through the fabric. The Met-Cradle+ is a set of printed overlays that cover the vital areas of the upper. These thin add-ons bolster the façade and allow it to tighten and loosen in conjunction with the lace-adjustments. The tongue and collar are slightly padded. The purpose of this design is to cushion the foot, hold it in place, and prevent it from slipping around the interior.